At Pelican Panels, all orders are made to suit your client’s requirements, preference, and location. Not only are we able to provide you with knowledgeable advice, but we will also make sure all the materials we use are of the highest quality. There are many fencing systems available, and choosing the right one for your client can be sometimes difficult. Here at Pelican Panels, we have extensive knowledge of the different systems, materials, requirements & regulations in the industry. 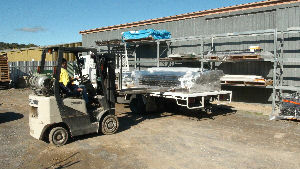 We service all areas with many happy clients in the metropolitan area, country SA & interstate. Our team is experienced in packaging orders for long journey’s so your job arrives in the excellent condition in which it left the factory.